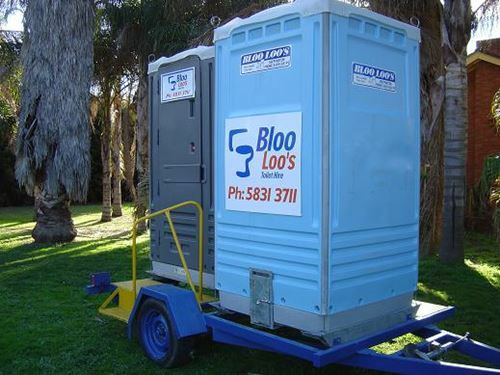 Bloo Loos extensive range of Toilets includes single chemical toilets, single or double toilets on trailers and All-Abilities toilets. We offer additional services such as cleaners, toilet supplies and pump out of toilets if needed. Not sure what you require? We love to talk about all the services we offer! Contact us today and let our experienced staff help you work out just what you need. We have developed a strong reputation within the event industry, supplying clean premium toilets for events, weddings, functions and festivals of all sizes. We discuss your needs and advise the right solution for your event including toilets numbers, delivery and cleaner requirements. We often insist our cleaner be hired for big events to ensure all our toilets are as clean at the end of the day as they are at the start. Even the most well-planned and exciting events can be spoiled by unhygienic toilets and patrons screaming ‘there’s no toilet paper!’ Our cleaner ensures water and toilet paper never run out! We can also arrange for toilets to be pumped out for multiple day events. Would you like a bin with that? Foott Waste Solutions can solve all your Event's waste needs by incorporating Waste and Recycling Bins and Toilets in an overall plan. Delivering toilets and bins together from one supplier will certainly reduce potential multiple delivery charges. Following each event we conduct an inhouse review of all aspects of delivery, equipment supply, placement and a cleaner’s report. Annual events are able to be finely tuned to ensure the best service provision with value for money. As event committees often change we find the review is helpful for new members to understand how we have previously helped make their event a success. Built to Australian Standards our All-Abilities toilets are specifically designed to cater for patrons who need extra room inside a toilet unit. The unit has a flat ground level entry floor with wide door for ease of access for wheelchairs, frames and prams. Inside is a spacious area with basin at wheelchair level and assistance bars. The All-Abilities unit is also popular for weddings where extra room is available to fit the bride, her dress and all her bridesmaids in if needed! 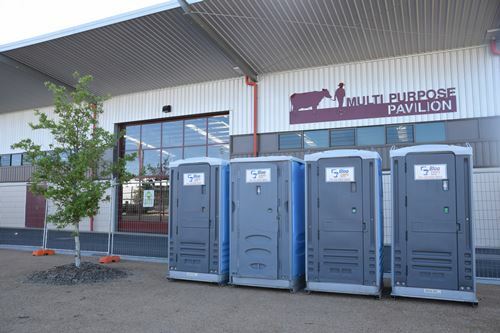 Many public events require an All-Abilities toilet to be available onsite and we are one of the few suppliers of these units in Northern Victoria. This self contained unit is delivered to you by one of our trucks fitted with a Moffet forklift system. A flat, level area of approximately 2.5m3 x 2.5m3 is required for easy access and convenience of patrons. We offer a building site package of single toilet and 3m3 builders waste bin with a reduced delivery fee (when delivered together). This offers the advantage of dealing with one office for all your waste needs. A ‘plaster-only’ recyclable 3m3 bin can also be added to the package and will help reduce waste costs. We offer builder’s hire package rates for short and long term hire. During the build project we can changeover the toilet to ensure a fresh and clean toilet is onsite at all times (fee applies). 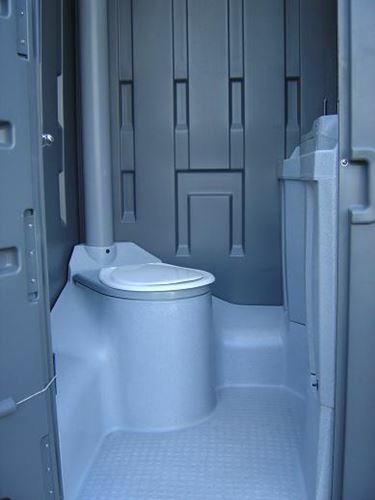 Call our experienced staff and let us design a toilet/bin hire package to suit your needs. We provide single toilets to Commercial and Industrial projects across Northern Victoria. A plan suitable to your needs is developed with our staff to ensure the most cost effective short or long term hire. Our most popular event toilets are our Single or double toilets on trailers. They are self-contained and hassle free to ensure your special event is a success. Each toilet is completely self-contained with a hand wash basin and wash nozzle. The unit has a 400 litre waste capacity – which equates to approximately 800 uses. As a general rule, one toilet is suitable for up to 100 people. These clean units on purpose built trailers (with steps) book out very quickly. It is more cost effective for you to collect the toilet trailer (towball and light connection required) or we can arrange delivery for a fee. We also have available stand-alone single toilets which we can deliver to you for an additional fee. Fruit pickers, grape pickers, farm hands and seasonal workers all need amenities wherever they are working onsite. Portable toilets are ideal to help manage peak season needs or be mobile to move through remote areas of the property as the workers move around. Bloo Loo’s toilets are durable, well maintained and easy to clean and service. Each toilet is completely self-contained with a hand wash basin and wash nozzle. The unit has a 400 litre waste capacity – which equates to approximately 800 uses. We work with property managers to schedule swapping of toilets ensuring the toilets are always functional and ready to go when the workers are. If you have a property or depot lacking toilet facilities we have the solution. Long Term Hire of our toilets is available including delivery and scheduling of changing over the toilets when needed. Our experienced team can guide you through how this works. Our popular building site package of a 3m3 builders waste bin, plaster bin and portable toilet offers set rates so builders can work within their budget. Builders know that working with our reliable team streamlines their requirements and takes one less hassle out of their build.